In this broad ranging study, Gretchen Woertendyke reconfigures US literary history as a product of hemispheric relations. 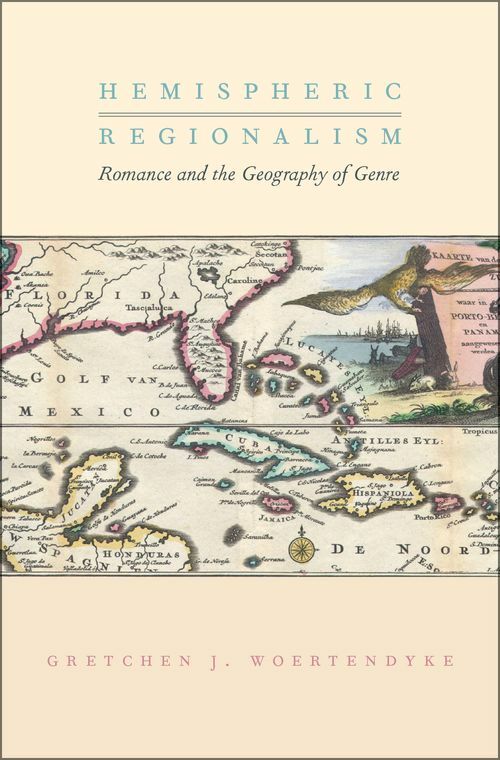 Hemispheric Regionalism: Romance and the Geography of Genre, brings together a rich archive of popular culture, fugitive slave narratives, advertisements, political treatises, and literature to construct a new literary history from a hemispheric and regional perspective. At the center of this history is romance, a popular and versatile literary genre uniquely capable of translating the threat posed by the Haitian Revolution-or the expansionist possibilities of Cuban annexation-for a rapidly increasing readership. Through romance, she traces imaginary and real circuits of exchange and remaps romance's position in nineteenth century life and letters as irreducible to, nor fully mediated by, a concept of nation. The energies associated with Cuba and Haiti, manifest destiny and apocalypse, bring historical depth to an otherwise short national history. As a result, romance becomes remarkably influential in inculcating a sense of new world citizenry. The study shifts our critical focus from novel and nation, to romance and region, inevitable, she argues, when we attend to the tangled, messy relations across geographic and historical boundaries. Woertendyke reads the archives of Gabriel Prosser, Nat Turner, and Denmark Vesey along with less frequently treated writers such as John Howison, William Gilmore Simms, and J.H. Ingraham. The study provides a new context for understanding works by Washington Irving, Edgar Allan Poe, Herman Melville, and James Fenimore Cooper and brings together the theories of Charles Brockden Brown, the editorial work of Maturin M. Ballou, and the historical romances of Walter Scott. In Hemispheric Regionalism, Woertendyke demonstrates that US literature has always been the product of hemispheric and regional relations and that all forms of romance are central to this history. Gretchen J. Woertendyke is Associate Professor of English at the University of South Carolina.